Think BC Wine for Father’s Day! 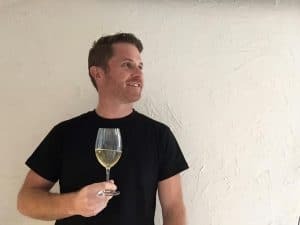 Rhys Pender MW – An educator, wine judge, writer, and grape grower/farmer, Pender has pursued his passion for food and wine by completing a professional culinary diploma and all levels of the WSET, and in 2010 he became Canada’s youngest Master of Wine. He runs a WSET wine school and consultancy through his business Wine Plus+, and is a regular contributor to publications such as WineAlign.com, Macleans, Montecristo, SIP and Taste. Pender judges wine competitions internationally such as the Decanter World Wine Awards and TexSom International Wine Awards, as well as for WineAlign and the British Columbia Wine Awards in Canada. Father’s Day is coming up quickly, on Sunday June 17, so now is the time to drop a few hints at what might make the perfect day for Dad! Many modern Dad’s might be keen for a change from the classic beer and a BBQ and looking for something that taps a little more into their interests in really good food and wine. Any good Father’s Day plan should be about something that Dad and the kids can do together. If plentiful food and wine is to be in the plans for later in the day, a healthy start getting some exercise with the kids is a great start. There are a couple of options to start the day making Dad feel like a beacon of well-being. June 17th sees the Father’s Day Run (or walk) for Prostate Cancer starting at 9am from Rhapsody Plaza Waterfront Park Kelowna. Another option is Hike N Yoga, or a Father’s Day hike on Sunday morning put on by The Amplified Collective. Fishing and Father’s Day is a classic match but not every kid might yet be willing to head out on an adventure into the wild in search of elusive fish. An easy Father’s Day fishing option is the Go Fish event from 10am-3pm at Mission Creek Regional Park and Shannon Lake Regional Park. This could be the youngsters, and some Dad’s, first chance at catching a beautiful rainbow trout. For the less outdoorsy, the Kelowna Art Gallery has Family Art Sundays that are a great cultural event, particularly for the younger kids. Surely after such an energetic and cultural start to the day there should be some great food and wine on offer? Many kids aren’t thrilled with a day of wine touring but there are a few great options to please everyone, especially dad. Combining a bike ride with winery visits may be the perfect compromise. 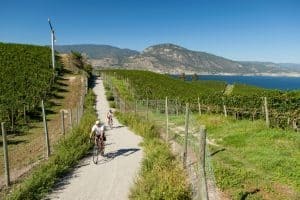 If in the Penticton area, head for the Kettle Valley Railroad (KVR) Trail in Naramata for a leisurely bike ride that can be as short or long as you like, with many opportunities to dart off to visit wineries and restaurants along the way. About thirty minutes along the trail from Penticton you can turn off and ride a couple of kilometres down for a tasting and lunch at JoieFarm Winery. 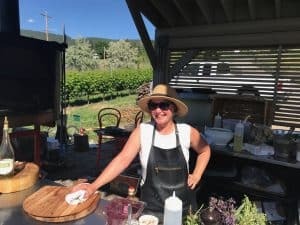 The weather should be perfect for lounging on the lawns with a glass of Gamay or Pinot Noir while trying Heidi Noble’s delicious European inspired, locally sourced menu at Picnique. After that, a leisurely ride back to Penticton with a final stop combining both cheese and wine at Upper Bench Winery and Creamery should seal the stomach on a perfect day. If in the Kelowna area a visit to Kelowna, West Kelowna or Peachland wineries in the afternoon shouldn’t bore the kids too much and after the morning activity a well-deserved lunch is in order. 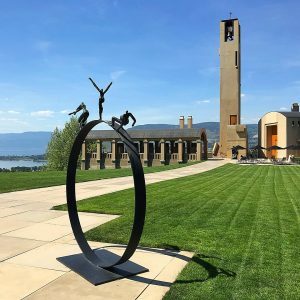 In West Kelowna the Terrace Restaurant at Mission Hill Family Estate Winery has a stunning view over the lake and has recently opened for the season. A house made pasta would be perfect for restoring those burnt calories. Orofino 2016 Wild Ferment Old Vines Riesling – serious Riesling. Vancouver Island Sparkling – some lovely bubbly starting to come off the island if you are touring in the area! Tantalus Chardonnay – Not overdone but seamless, complex, fresh and elegant. Modern Chardonnay. Singletree Rosé – real men drink good dry Rosé. Joie Farm Gamay – a light red, lightly chilled is perfect for the summer! Le Vieux Pin Cuvée Violette Syrah – gamy, meaty, peppery and packed with fruit, the perfect wine for the BBQ. Laughing Stock Portfolio – something to give Dad something to Dad to beef up his cellar. Tell him not to touch it for at least five years.